Global Taekwon-Do United Kingdom (GTUK) are a sister club within the UITF, headed by Grandmaster Roy Oldham IX. They have a number of active University clubs, including our dear friends over at DMU; with members regularly appearing within ULTKD and frequently encountered at tournaments. 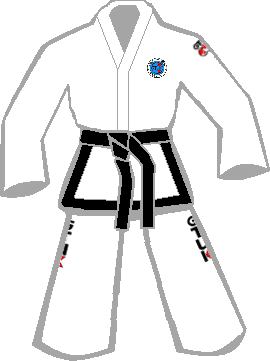 The GTUK dobok follows the standard ITF pattern of a plain white dobok top and trousers, with black edging to the bottom of the shirt for dan grades. The shirt carries the GTUK logo on the front left, with a club logo on the front right. 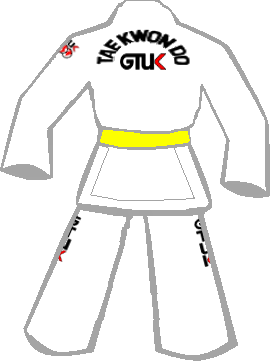 The left sleeve has another GTUK logo, and the works GTUK are written vertically down the side of the legs. The back of the shirt carries the words 'Tae Kwon Do' and 'GTUK'.